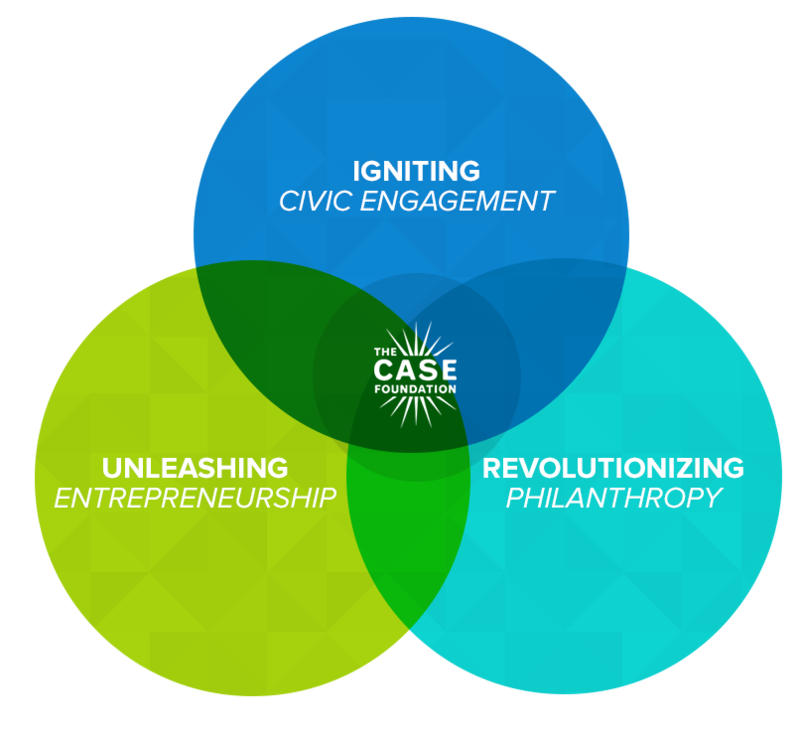 At the Case Foundation, we are driven by our mission to “invest in people and ideas that can change the world.” Every day, we apply a Be Fearless approach to catalyze movements that drive transformational change. By living the Be Fearless principles of big bets, risk taking, failing forward, unlikely partnerships, and urgency, we identify opportunities where innovation is needed to address urgent challenges. Our movement catalyzing approach is centered around forging alliances, experimenting and investing in people, ideas and organizations that harness the best impulses of entrepreneurship, innovation, technology and collaboration. With this commitment to driving movements, we focus on inspiring, educating and activating people and organizations to action. To maximize the impact of our work, we take an “all-in approach,” leveraging our employees’ and partners’ expertise in social innovation, social networking, marketing, digital strategy, storytelling, technology and other areas to provide programmatic support to catalyze movements and social change. Today we are driving at two major movements—Impact Investing and Inclusive Entrepreneurship. We believe there is a powerful economic opportunity to seize by providing the resources necessary for entrepreneurs from all races, places and genders to succeed. By bringing a more diverse set of innovators to the table to drive high-growth startups, we see the potential to accelerate economic growth in the United States. To accomplish this goal, we work to build onramps to funding, networking, mentoring and media coverage for women and entrepreneurs of color. This is not only good for entrepreneurship, it is good for the American economy. We believe that impact investing is revolutionizing the way we put investment dollars to work by aligning the pursuit of profit and purpose. We work to push the growing impact investing movement forward to ensure that financial instruments that intentionally generate both financial and social returns move into the mainstream. As the field grows, our work is focused on providing access to information that the movement needs to attract capital from traditional players and expand onramps to those looking to start their Impact Investing journey. Throughout our history, we have found that three key pillars support all the Foundation’s efforts to drive social change: revolutionizing philanthropy, unleashing entrepreneurship and igniting civic engagement. These pillars encapsulate our three main areas of interest and are core strategies that we deploy across our movements to activate change. We believe real impact can be made when we deploy these three strategies and these continue to guide our activities and our collaborations with partners as we work to uncover new, more impactful ways of addressing chronic social challenges. For nearly two decades, the Case Foundation – along with our partners – has led a series of initiatives that aim to tap into innovative new models, make the best use of technology, harness entrepreneurial approaches and facilitate collaboration across sectors to address urgent social challenges. Along the way, we’ve committed to sharing what we’ve learned – both successes and failures alike – with the hope of providing useful insights to fellow changemakers as they seek to strengthen their work and increase their impact.